If you are a Nikon DSLR shooter, you most likely came across a camera setting called “Exposure Delay Mode”, which can be very useful in eliminating camera shake from the camera’s mirror mechanism. While Exposure Delay Mode is a wonderful feature, many photographers often misunderstand it and end up either misusing it in the field, or not using it at all. In this article, we will look into Exposure Delay Mode in detail and go through different case scenarios where it can be very helpful in reducing camera shake and yielding sharp images. 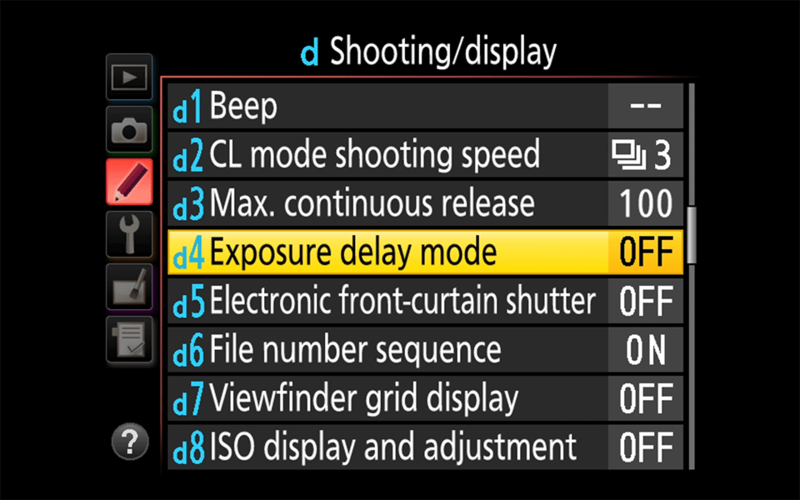 1) What is Exposure Delay Mode? Camera waits for 3 seconds, which allows mirror-induced vibrations to calm down. Shutter remains closed. The camera shutter is engaged (front and rear shutter curtains come down) to let light reach the sensor and capture the image. Front and rear shutter curtains return back to their initial positions. EDM can help reduce mirror slap significantly, especially when shooting at slower shutter speeds. If you experience blurry images when taking photos on a tripod, it is always a good idea to use either EDM or Mirror Up mode to reduce mirror-induced camera shake. What’s great about EDM, is that it can be used in combination with different camera modes. For example, you can use EDM in combination with a Self-Timer, and it even works when using Live View – see below for more information on camera behavior when using different camera modes. All you have to do is visit Menu -> Custom Setting Menu -> Assign Fn Button / Assign Preview Button -> Press + Command Dials -> Exposure Delay Mode. Once you assign EDM to a button, you have to press and hold the button, then use the rear dial to toggle between different timers, or to turn the feature off. Doing this will allow for quick changes to EDM in the field. Another way to make it easier to access EDM is to add it to the camera’s “My Menu” section, then assign a button to get to “My Menu” with a single press of the button. Personally, I prefer the former method instead of going through the camera menu, because I can keep my gloves on when working in cold environments. It is important to point out that EDM works very differently compared to Electronic Front-Curtain Shutter (EFCS). EDM is basically a timer that can be effective in reducing mirror slap vibrations, whereas EFCS is only good for shutter shock vibrations. This means that ideally, you should be using the combination of the two in order to reduce or even eliminate camera shake from both the camera mirror and the shutter on a DSLR camera. While both EDM and Mirror Up can do the same thing by raising the mirror and letting it stay in that position until vibrations are reduced or eliminated, the main difference between the two, is that one can use EDM in combination with pretty much any camera mode, including Mirror Up. In essence, EDM is a timer before image capture. For example, when using Live View, EDM does not raise the mirror, since the mirror is already up – instead, it works as a timer before an image is captured. If one uses Mirror Up without EDM, the shutter release has to be engaged twice: the first release raises the mirror and locks it in that position, whereas the second release captures the image and brings the mirror down. However, the main benefit of using EDM in combination with Mirror Up mode, is that it allows one to take pictures without needing a remote shutter release cable / trigger. When EDM is enabled and Mirror Up mode is selected, you can use your fingers to trigger the camera shutter. When triggering the shutter release the first time, the mirror is raised (if EFCS is enabled, the front curtain shutter is also raised at the same time), then triggering the shutter release the second time will engage the EDM timer. The camera will wait until the timer expires, then it will capture the image, after which the mirror comes down. That delay between you squeezing the shutter release for the second time and the actual image capture is what allows vibrations to calm down, resulting in sharp images. See below for more information about the different combinations of EDM and camera modes. Since EDM is such a powerful feature to reduce camera shake, I pretty much stopped using a remote shutter release in the field. Now I only carry a remote shutter release for one reason – in order to take exposures longer than 30 seconds. In fact, with such cameras as the Nikon D810 and D850, there is not even a need for a remote shutter release for long exposures anymore. If I forget the remote shutter release cable or don’t feel like plugging it in, I simply set the camera to “Time” mode (Manual Mode, one click past “Bulb”, appears as two dashes “–“), then fire up my phone’s timer to measure exposure length. Pressing the shutter release one more time stops the exposure and I can do this for any length of time, provided that my camera battery lasts. Let’s take a look at different combinations of EDM and camera modes and see which ones work best in the field. Even if you choose not to use the Mirror Up mode, EDM can be very useful when shooting in other camera modes such as Single, Continuous, Quiet and Self-Timer. When shooting from a tripod, it is best to use EDM with at least 1 second timer in order to dramatically reduce camera shake. So if you are in Single, Continuous or Quiet modes, EDM with 1 second or longer will help reduce mirror slap significantly. However, it is important to note that if your camera is equipped with EFCS, it is best to avoid using EDM + Single Release, EDM + Continuous Release modes or EDM + Quiet Release modes (D7500, D500, D810 and D5 only), because EFCS does not work in those modes. Camera Behavior: Mirror is raised as soon as the shutter release button is pressed (front curtain shutter is closed, since EFCS is disengaged). Camera waits until EDM timer expires, then captures the image. Mirror comes down. My personal favorite is EDM + Self-Timer mode on older Nikon DSLRs, because it reduces initial vibrations from my hand even before the mirror is raised. That’s what I default to when shooting with the Nikon D800 / D800E. However, on newer cameras with EFCS (such as D7500, D500, D810, D850 and D5), it is best to avoid EDM + Self Timer, because EFCS is not engaged. On the Nikon D850, EDM + EFCS work in three different camera modes: Quiet (Q), Quiet Continuous (Qc) and Mirror Up (Mup). Camera Behavior: Self-timer is engaged as soon as the shutter release button is pressed. After the timer expires, the mirror is raised (front curtain shutter is closed, since EFCS is disengaged). The camera waits until the EDM timer expires, then captures the image. Mirror comes down. Not an ideal combination when EFCS is available, because only vibrations from the mirror are reduced, while vibrations from the shutter mechanism are still present. Camera Behavior: First shutter release raises the mirror immediately, but the front curtain shutter remains closed, since EFCS is turned off. The camera stays put and waits for the second shutter release. Upon second shutter release, the camera waits until the EDM timer expires, after which the image is captured and the mirror comes down. An ideal combination for all Nikon DSLRs that have EFCS. On newer Nikon DSLRs like D850, it is also possible to use EDM + Quiet / Quiet Continuous Release Modes + EFCS On to completely eliminate camera shake from the camera mirror, as well as the shutter mechanism. Camera Behavior: First shutter release raises both the mirror and the front curtain shutter, since EFCS is turned on. The camera stays put and waits for the second shutter release. Upon second shutter release, the camera waits until the EDM timer expires, after which the image is captured and both rear curtain shutter and the mirror come down. The behavior of EDM + Mirror Up on the Nikon D850 is different when using Live View. In Live View mode, one has to only press the shutter release once to take a picture, whereas older cameras like the Nikon D810 require engaging the shutter release twice. The Silent Shutter Mode (also known as “Electronic Shutter”) is only available on the Nikon D850. One must be in Live View mode and set up the camera by pressing the “i” button, navigating to “Silent live view photography”, then picking “Mode 1”. Once turned on, the camera will not engage its shutter mechanism at all and there won’t be a need for either Mirror Up or EFCS, since the mirror is already raised and the shutter mechanism is disabled. When using this feature, it is best to use it in combination with Self-Timer, but one can also use it in combination with EDM timer. 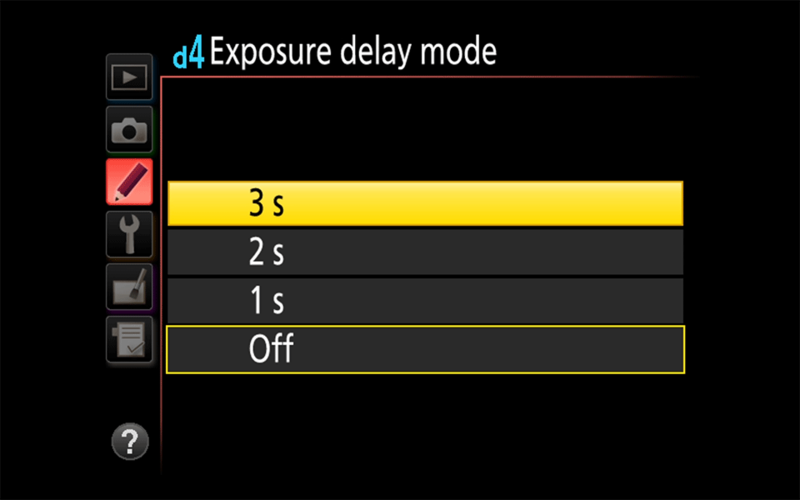 Exposure Delay Mode (1-3 seconds) + Self-Timer, or Live View + Exposure Delay Mode (1-3 seconds). Exposure Delay Mode (1-3 seconds) + EFCS On + Mirror Up, or Live View + EFCS On + Mirror Up. Exposure Delay Mode (1-3 seconds) + EFCS On + Quiet / Quiet Continuous / Mirror Up, or Live View + EFCS On + Mirror Up, or Live View + Silent Shutter Mode + Self-Timer (when subject is not moving). Another feature that I have found useful on D500 and D850 is that in live view mode, if you gently touch the screen, the shutter is released. This act produces much less vibrations as compared to mechanically pressing the shutter. In Live View mode, as you rightly said, mirror is already up. Vikram, that’s a good point. The D850, in particular, is excellent with the touchscreen in live view. Thank you for this valuable information. I have used a D800e for three years, with the self-timer + 3 sec. exposure delay; had I not read your article, I would have followed the same procedure a recently used D810. You are most welcome! The D810 is a much better camera when it comes to mirror slap and shutter shock. With EFCS, you can completely eliminate vibrations, which is nice. Really appreciate it the information in this article . Thanks a lot Nasim . You are most welcome Hazim! Nasim! Thank you!!! I’ve been shooting with my D810 for years, and I somehow never knew that time mode existed. I’d always just used bulb mode. You’ve given me the answer I’ve always been looking for in the struggle between holding down the button on my wireless remote and not wanting the fuss of my wired remote release. Thank you so much! I never realized I could press once to start and once to end. I suppose I never scrolled past bulb mode. I almost passed on this article because I understood exposure delay, but I’m so glad I didn’t because I probably never would have learned about time mode otherwise! Yours are some of the most informative, well thought-out, and best written photography articles on the internet. Thanks again! Nick, glad you read the article and happy to hear that you learned something from it. Thank you for your feedback! First of all, thank you Nasim for the through exploration you just reviled to us. No matter how many times one read the instruction books of cameras we will never achieve full understanding on how to benefit from all of ever evolving technology of a particular brand of a camera. Your articles always make it easy to explore and understand different functions. After all, having knowledge of any camera full function will make any enthusiastic photographer to take better pictures. I wish from you to always give us detailed insights on how to fully utilize different function and move functions as well, just like this well explored article. I own D800e, D810 & D850 just for the love of photography. Nasim! Thanks for this wonderful insight. I normally use Aperture Priority mode with handheld telephoto 200-500 lens with D500. I hope with EDM on with say 1 sec and EFCS off , i should be able to shoot in a continuous mode with improved results. Would you agree? Asuri, if you shoot with the 200-500mm on a tripod and you take single exposures, then EDM will help. But for hand-held shooting or when shooting fast action, you are better off turning it off completely. Yes sir. That’s what i thought. For fast action EDM is not going to help. But what i did yesterday was to try out on a table fan. With EDM and EFCS and Mirrorup on (EDM delay 1 sec) i set the D500 to continuous mode and took pictures to freeze the blades of the fan.I took continuous shots. I could get some pictures of the blades frozen. But this will not work on a moving bird or on a fast action scene….This may result in blur , loss of focus etc…. Hallo Nasim, your tips are very profits and precious and i thank you very much. But, what about d750? You don’t say nothing about this camera. Why? la d750 non cela questa funzione ? Si cela, “Custom settings” e poi D4. What a great tip! My remote shutter release has a short in the cable, and doesn’t always work…especially on a cold morning. I’m going to start using the exposure delay–I’ve already set the preview btn and everything! Thanks for another useful tip. This is the most useful article I’ve read in a long time. Thanks for the information Nasim. Nasim, thank you again for another very helpful article on the subject of camera vibration reduction techniques. on your last paragraph you point out three strategies that we can use on a Nikon D850. Could you detail how to program “My Menus” to add all three methods? I use the combination of 3-second Exposure Delay and Electronic Front Curtain on my D810. This avoids using a wired cable release (which I broke on Day #1 in the field). I always shoot at my tested optimum aperture and ISO 64 for the absolute best possible image quality. Kudos to the author for featuring this in his article. I would highly suggest to use EDM + EFCS + Mirror Up. If you don’t use the latter mode, EFCS is of no use, since it is disabled. I have a D810 and a D500, which I use for landscape and wildlife photography. I shoot with a tripod when I can, but often end up shooting handheld as well, sometimes from a boat. My lenses go from 20 mm to 300 mm + TC. From your article I surmise that EDM would be useful for the landscapes and perhaps stationary wildlife subjects when using a tripod. Is this correct? Do you have any other recommendations for this combination of equipment and subjects? Hirtz, I cannot see using EDM when shooting wildlife, because that one second of extra timing might screw up the image, especially if the bird is moving. I would suggest to use it when shooting stationary subjects, while you are shooting off a tripod. I’m not sure if I’m missing something but why would you need exposure delay mode AND mirror up used in combination with electronic front shutter curtain? Exposure delaye mode accomplishes the mirror up aspect so I could be in any mode, not necessarily mirror up mode right? John, exposure delay mode is simply a delay of x number of seconds before an image is taken. You can take advantage of it in any mode, including mirror up. Why would you want to have EDM + Mirror Up + EFCS? Because EFCS does not work other camera modes, especially on cameras like Nikon D7500, D500, D5 and D810 – you must be in Mup mode to take advantage of it. If you use Mup + EFCS, technically you don’t need to have an EDM timer, but if you just want to shoot away without having to worry about waiting in Mup, then EDM can also help. Great explanation, thanks. So if the camera does not have EFCS, then Mup does not need to be used right? EDM does it all I think. Very valuable article, thank you. You are most welcome Michael! I very much enjoy your articles. Can you please create a “print” article button? I’d like to print this article and take it with me in the field. Same thing for a number of other articles. thank you. Sfoak, unfortunately, we do not have a way to make a print version from articles. You are welcome to try it out using different tools like Adobe Acrobat, but formatting might be a bit tough and you might need to edit it first. We will make some PDFs for certain content on the site, but cannot make print-friendly versions very easily. We have tried different plugins before and they weren’t particularly good, so we removed the functionality. You can safely copy and paste the article onto a work sheet like MS Word. From your computer you can then transfer the file to your phone or Ipad and can be accessed in the field without all the paper work flapping about. Nasim, thank you for the intro to EDM. I found that my D3X has no EDM timer options and defaults to a 1s delay. Not sure that’s long enough but will give it a shot. Since Nikon has discontinued the GP-1A – essential to my work – and the fact that the part that always breaks is the shutter release cable socket, while the GPS continues to function, this may be a workaround. Nasim, I can only join in and say a loud Thank You for so many tips over time. One thing I continue to debate with myself: I always shoot at 1/800 or 1/1000 (sometimes much faster if needed), so that I don’t need to worry about camera motion, or lug a tripod, or usually care about subject motion usually. But, do I still need to care about mirror or shutter disturbance? I think not, but not sure?? Walt. Could you please comment on using in EDM in combination with Image stabilization lens. What effect does EDM have on the image stabilization algorithm? Do you need a tripod to use EDM? I have a D500, and I wanted to program one of the Function buttons to activate EDM, but I do not find f5 Assign Preview button in the menu. I have the EDM assigned to FM button on my D750 but unfortunately it’s not possible on my 10 year old D700. When on a tripod and using a remote release, have you done any comparison images using EDM and normal(non-EDM)mode with shutter speeds of 1/250 and above. I have read ( and been told by workshop leaders) that tripod images w/ remote release at shutter speeds 1/250 and up don’t show mirror motion , even though it is theoretically not obliterated by the tripod, remote release, and shutter speed. If the motion is discernable, I’ll see if my D700 can incorporate it with tripod use. I turn to you daily — thank you for such a brilliant site! One thing I’ve never understood, which I hope is relevant here, is why one wouldn’t always leave EFCS permanently switched on. I imagine i’ll kick myself once I know but your thoughts would be most welcome. thank you. Very useful information and well written. I enjoy your website and I’m learning a lot about my new D850 as a result. I look forward to yoru reviews even though I find using only my one NIkon 24-120 G lens is all I need with my prior D810 and now my D850. Simple seems to work best for me. You also have a very good eye for composition and I enjoy your insights into location and capture methods. Keep up the good work! A sample gallery using my D810. I try to get back to Point Lobos with each new camera. Such a wonderful place. Thank you, Nasim, for this great article. I just upgraded from D610 to D850, and learned a lot from your advices. One question regarding your recommendations for shooting D850 on tripod at the end. One of the recommended settings is: Live View + EFCS On + Mirror Up. If the mirror is already up under Live View, why do you recommend the Mirror Up setting with Live View? Isn’t it redundant? Can I just use Live View + EFCS On ? Ziyong, that’s because Live View + EFCS doesn’t work by itself, unless you shoot in Mirror Up mode. The only way to make it vibration-free is to enable electronic shutter, which works differently than EFCS and can introduce rolling shutter issues to moving subjects. Nasim, Thanks for your response, but I tried on my D850 both “Live View + EFCS On” and “Live View + EDM + EFCS On”, in Continuous Low Mode without Mirror Up, they seemed to work fine. Just want to let you know this. Thanks. Last word is “successfully”. Had some issues with reCAPTCHA. Nasim, thank you so much! I almost will be sold my 810 but your article is awsome about these magic tricks. I thought my images not qauite sharp because of 36 pix ( because I able to shoot very sharp image on set 9pix “RAW” ) . Thank you so much for a really informative article. Nasim, another outstanding article. Quick question. When using the 850 + LV + Silent Shutter mode, you suggest using the self-timer rather than EDM. Can you explain why? Is there some difference in the interaction of the various features? Thanks so much for all that you do. Can I ask somthing completely different. I’m off to China, South Korea, Vietnam and ohers for three weeks. I want to travel light and have opted for the Nikon 28-30 on my D750. I’m guessing I will need more reach and am considering a 2x teleconvertor to give equvilant 0f a 600mm lens, I have a 150-600 Sigma sport but its big and heavy. Ive tried a couple of Nikon Fit Sigmas, 1.44 and 2.00 but they do not fit this or any other Nikon lenes. Even Nikon teleconvertors are not recomended by Nikon. Ine also looked at Kenco convertors but they do not get good reviews. Am I detined to carry my 150-600 or do you have any solutions to help keep thigs light. Man this site is like having an instructor at your side 24/7 you guys and girls are great. The perfect answer for my sleep abnea too.? Thanks Nasim Mansurov this site is the bomb! And agin thanks for the information. Man this site is like having an instructor at your side 24/7 you guys and girls are great. The perfect answer for my sleep abnea too.? Thanks Nasim Mansurov this site is this bomb. Thanks Nasim for many of your articles that are most useful in my journey to enjoy my photography more and to shoot better and meaningful shots. I have a D7100 and plan to buy a D3200 to D3400 or D5200 to D5600. Question is whether these cameras have EDM and if not I believe activating Live View and timer would suffice ? Wow Nasim, this is one of the most useful articles I’ve read so far to improve my photos! Most of the time i’m using my D810 on a tripod with Live View. After reading your article about EFSC, I started using that function. I wanted to know more about this topic and ended up in this article. Before, I was using the Self-Timer (5 sec.) to reduce vibrations. Compared to the Self-Timer, the Mup mode takes more time to take a photo. Is there a benefit of using Mup in stead of the Self-Timer? Because the mirror is already up when using Live View, right? Please correct me if I’m wrong! Thanks for all the effort, it helps me a lot!! Very useful as I come back to your resourceful site again and again. As you say, use Exposure Delay Mode (1-3 seconds). What specific value you recommend for still subject? Can I use say 0.3s(minm value) on D850 for a perched bird or a still insect also ?